Students demonstrate how to use the repetitive transcranial magnetic stimulation device. The project's lead, UTD's Dr. John Hart Jr., stopped by KERA to talk about what his team found. "Post-traumatic stress disorder — the words are really important; post-traumatic means you have to have a traumatic event. Typically you have to experience a life-threatening event where your life is threatened or someone near you's life is threatened. And after that event, it is typically not immediate, can happen up to months later, you start having certain symptoms related to it that can be to the point of being a disorder, meaning they're disabling enough to interfere with your life." Re-experiencing. You have what people used to call "flashbacks," where the trigger to the event will have you feel actually back in that place with all the fear and all the trauma associated with the original event. Hyperarousal. A hyperemotional state where a little bit of a threat might make you get way, way more over-responding to it than you would typically. Avoidance. People go out of their way to avoid triggers to the point of having agoraphobia, even being afraid of crowds, being afraid others in large groups. Nightmares. They'll have nightmares about the event to the point that it will disrupt their sleep, so much so that the sleep disorder becomes a big part of their issues and problems. 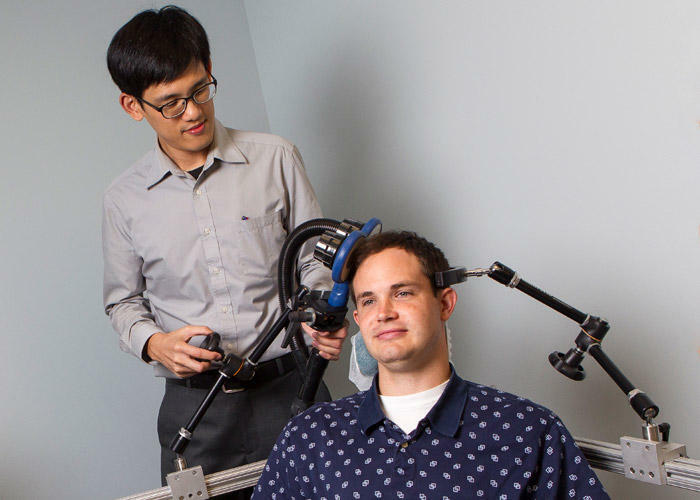 "Repetitive transcranial magnetic stimulation, called RTMS, is something we've been working with for years. It's a figure-8 coil, incased in plastic, and you just hold it outside someone's head. It's a magnet. When you alternate north and south poles on the magnet, you generate a low-level, low-field electrical current. And what we found in doing our research is that if you do that on the right side of the frontal lobe of your head or on the right side of the forehead, the magnet will block that fear signal and have you not over-respond to a traumatic memory. We actually did this first in PTSD patients. "In cognitive processing therapy, you teach people strategies and techniques of how to deal with this memory and how to work with it so it does not overwhelm you with the fear part. What we found out was those that got the RTMS with it got better quicker. It lasted longer, and they got a better response to the treatment. Six months out, they still were doing really well, maybe even going a little bit better in terms of their improvement, while the folks that didn't were leveling off or sort of rebounding back up and having a few more symptoms again." Dr. John Hart Jr. is the distinguished chair in neuroscience at the University of Texas at Dallas. This interview was lightly edited for clarity.